Soft Vengeance is a documentary film by veteran filmmaker Abby Ginzberg, which finds its narrative among the more hopeful stories about a turbulent period in South Africa. The film recounts Albie’s tale through archive footage, photographs, TV spots from around the world, views from scholars and international anti-apartheid activists, a series of interviews with some of the great and good of ‘the struggle’ – Desmond Tutu, Yvonne Mokgoro, Geraldine Fraser-Moleketi, Cyril Ramaphosa, Nadine Gordimer, Denis Goldberg – and some vulnerable and disarming narrative from Sachs himself. 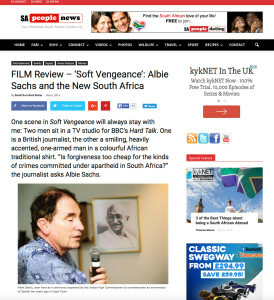 I was asked to review Soft Vengeance in the lead up to the UK Jewish Film Festival 2015 in London. It was exhibited as part of the festival on 7-22 November. My review was published on 5 November 2015. You can read it online in sapeople.com or you can download the pdf by clicking on the image above. Please go to: contact Sandi if you would like me review a film or theatre production for your magazine, newspaper or production website.